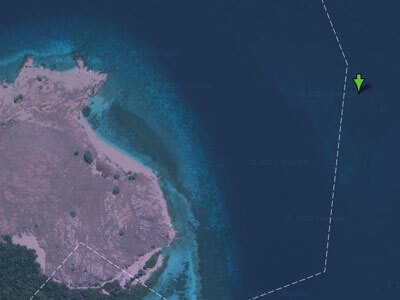 Tatawa Besar is one of a largee number of small islands or rocks located at the northern end of Linta Strait which is between Komodo Island and Pulau Rinja. This site is off the eastern side of the island. An approximate GPS mark for the dive spot is 8º 30' 39.1"S 119º 38' 46.4"E (using WGS84 as the datum). The site is towards the shore from the GPS mark. 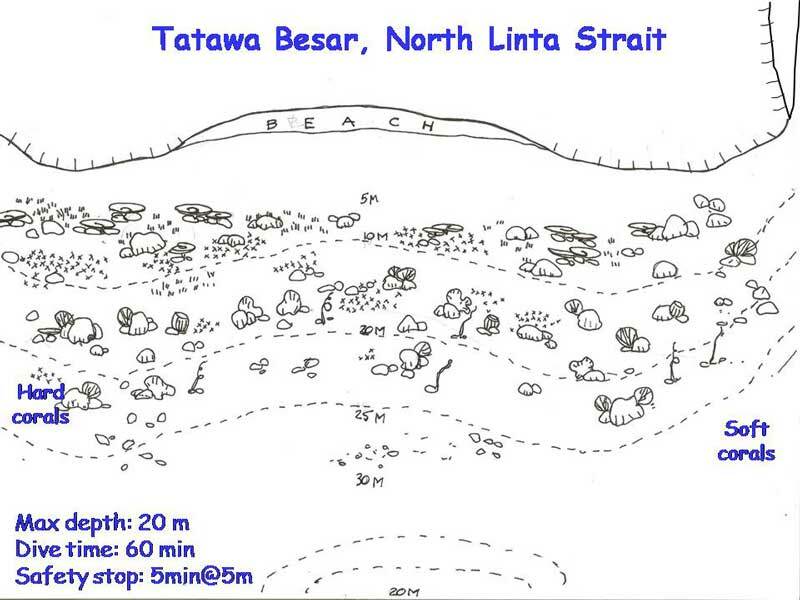 The actual site is located off the eastern side of Tatawa Besar. The dive is done as a current dive, starting at the appropriate end. We started at the north-eastern corner off the island and drifted south. As with virtually all dive sites that you do when on MV Mermaid II, you use the RIB (rigid inflatable boat) to get to the start of the dive (and also to get back to the boat). The RIB will drop you close to the island. Once in the water, we dropped to 10 and then gradually descended to about 25 metres over the next four minutes. The current was about half a knot so very easy to stop and photograph something or even swim against it for a short distance. 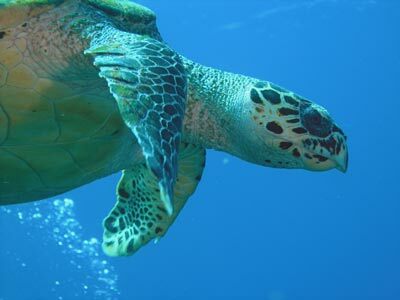 As soon as we hit the bottom we saw a turtle. It was very placid and allowed us to get some nice video and photos. 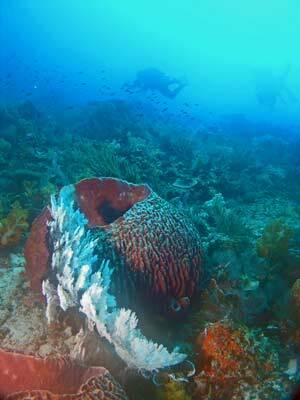 The site consists of a gentle slope of sand with small bommies of coral. It gets to about 30 metres. This site has lots of small gorgonias (including some very nice white ones) and barrel sponges as well as other sponges and very colourful soft corals. 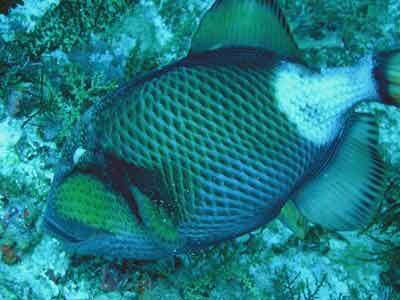 There were large numbers of titan triggerfish, I counted at least six very large ones. I would not want to do this dive when it was nesting season, it would be hell trying to avoid their nasty aggressiveness. 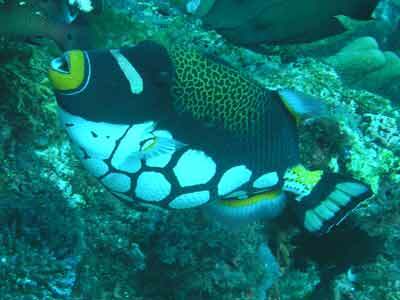 There were also five clown triggerfish, what I believe is the most beautiful fish in the ocean. I think this may have been the most I have ever seen on one dive. There were also very large red bass, much bigger than the ones I have seen on the Great Barrier Reef. As we drifted we gradually ascended from 25 metres. 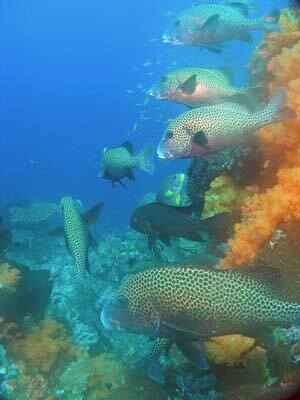 There were some schools of sweetlips and snapper and short-fined bannerfish. 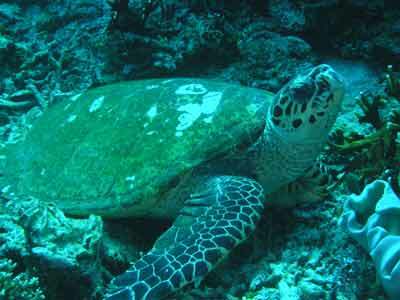 As mentioned, we saw lots of turtles and some of these were free swimming. 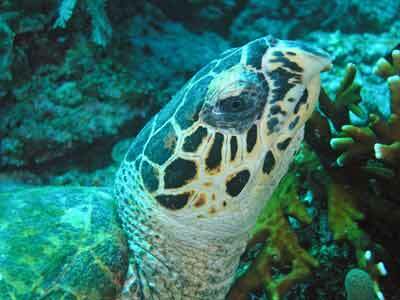 They were easy to get photographs and video as they slowly swam along. After 45 minutes we were at about six metres and spent the next 15 minutes doing a safety stop along the shallows. 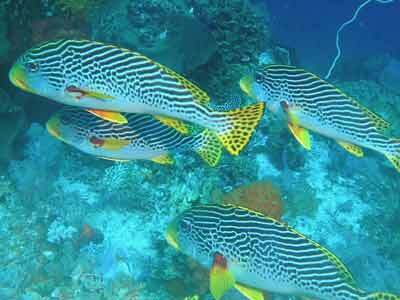 In the shallows we saw mantis shrimps as well as clownfish. 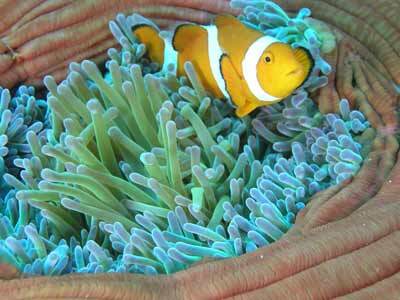 We also saw some anemones barrelled up with clown anemonefish (Nemo) in them. They are so cute, no wonder they made a movie about one. This site had all the normal smaller tropical fish, but there were not as many nudibranchs as we have seen at other dive sites on this trip. This was an excellent and easy dive. 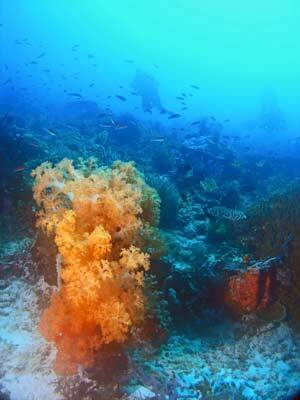 The visibility was 30 metres and the water temperature was about 27ºC. Click here to return to see the dive profile from my computer.